Explanation: Venus, named for the Roman goddess of love, and Mars, the war god's namesake, came together by moonlight in this lovely skyview, recorded on February 20 from Charleston, South Carolina, USA, planet Earth. 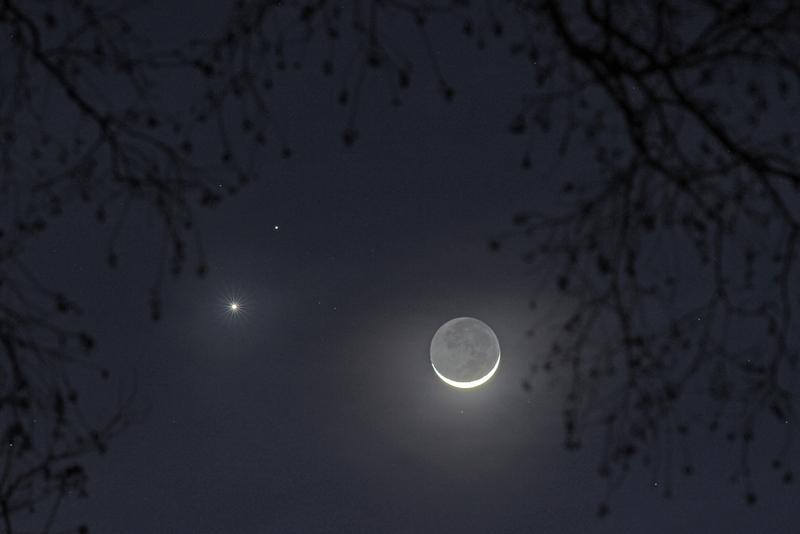 Made in twilight with a digital camera, the three second time exposure also records earthshine illuminating the otherwise dark surface of the young crescent Moon. Of course, the Moon has moved on from this much anticipated triple conjunction. Venus still shines in the west though as the evening star, third brightest object in Earth's sky, after the Sun and the Moon itself. Seen here within almost a Moon's width of Venus, much fainter Mars approached even closer on the following evening. But Mars has since been moving slowly away from brilliant Venus, though Mars is still visible too in the western twilight.